The SEAS Device ontology defines seas:Device as physical system that are designed to execute one or more procedures that involve the physical world. seas:Sensors implements seas:Sensing procedures and do seas:Observations. Sub types of seas:Actuator, seas:Actuating, and seas:Actuation, may constrain the type of the value of the property. For instance ontology seas:BooleanOntology defines seas:BooleanActuator, seas:BooleanActuating, and seas:BooleanActuation, that constrain the acted upon property to be a seas:BooleanProperty. Other ontologies may define many more. Similarly, sub types of seas:Sensor, seas:Sensing, and seas:Observation, may constrain the type of the value of the property. For instance ontology seas:BooleanOntology defines seas:BooleanSensor, seas:BooleanSensing, and seas:BooleanObservation, that constrain the observed property to be a seas:BooleanProperty. Other ontologies may define many more. 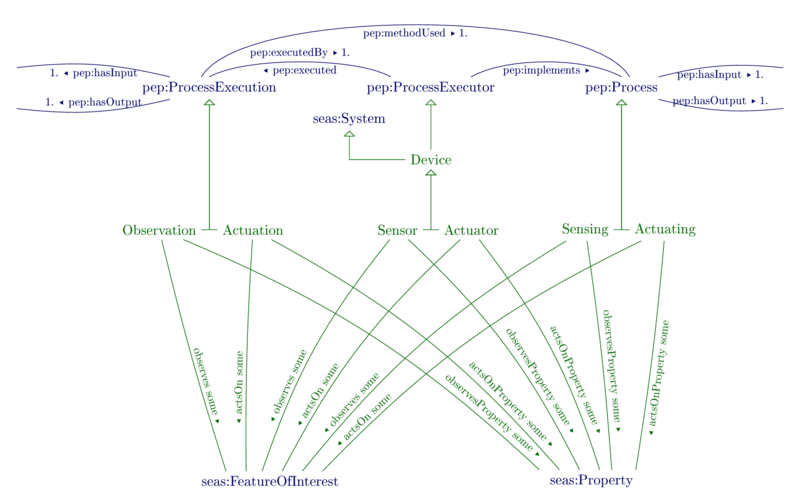 Alignments to the SSN ontology is proposed in SSNAlignment. Actuating is a procedure that has an impact on the physical world. An actuation is the execution of some actuating procedure by some actuator, and has an impact on the physical world. An actuator is a device that implements some actuating procedure, and has thus an impact on the physical world. Device is a physical system designed to execute one or more procedures that invove the physical world. A seas:Device is also a pep:ProcedureExecutor from the Procedure Execution Ontology (PEP). As such, it may implement procedures, and generate procedure executions. If SEAS was to be aligned to the SAREF ontology, seas:Device would be more generic than saref:Device. A seas:Device may also be aligned with the SSN ssn:Device. An observation is the execution of some sensing procedure by some sensor. Sensing is a procedure where stimuli from the physical world are used to produce outputs. A sensor is a device that implements some sensing procedure, and hence uses stimuli from the physical world to produce outputs. Links an actuating, actuator, or actuation, to the feature of interest a property of which it acts on. seas:actsOnProperty < seas:actsOn o seas:isPropertyOf . seas:actsOn < pep:usedProcedure o seas:actsOn . seas:actsOn < pep:madeBy o seas:actsOn . Links an actuating, actuator, or actuation, to the property it acts on. seas:actsOnProperty < pep:implements o seas:actsOnProperty . seas:actsOnProperty < pep:usedProcedure o seas:actsOnProperty . seas:actsOnProperty < pep:madeBy o seas:actsOnProperty . Links a sensing, sensor, or observation, to the feature of interest a property of which it observes. seas:observes < seas:observesProperty o seas:isPropertyOf . seas:observes < pep:usedProcedure o seas:observes . seas:observes < pep:madeBy o seas:observes . Links a sensing, sensor, or observation, to a property it observes. seas:observesProperty < pep:implements o seas:observesProperty . seas:observesProperty < pep:usedProcedure o seas:observesProperty . seas:observesProperty < pep:madeBy o seas:observesProperty .